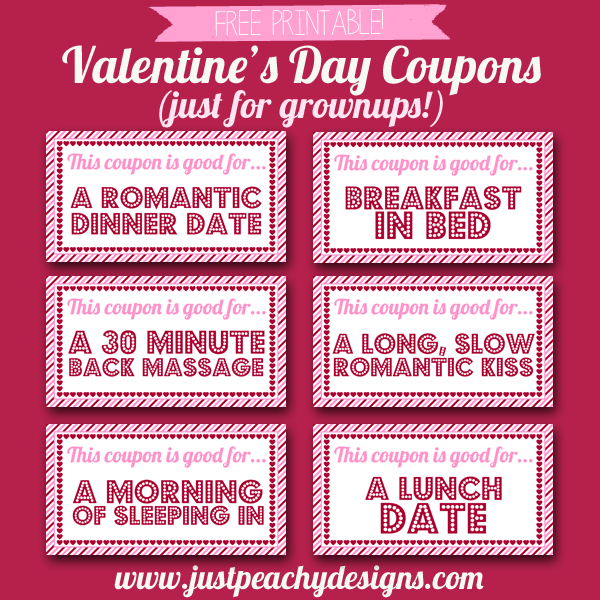 Just Peachy Designs: Free Valentine's Day Coupons For Grownups! Free Valentine's Day Coupons For Grownups! Last week, I posted these printable Valentine's Day coupons for kids - now I've got some printable coupons for grownups! Show your love with a promise of a romantic dinner or a back massage, among other things. I, for one, would be thrilled just to have a morning to sleep in! Just click the image above to download. Happy Valentine's Day!